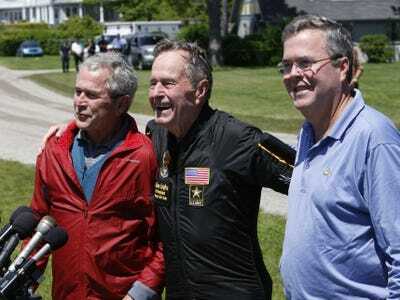 AP/Robert F. BukatyFormer President George H. W. Bush, center, is joined by his sons, former President George W. Bush, left, and former Florida Gov. Jeb Bush, as he speaks to reporters after his parachute jump with the Army Golden Knights parachute team to celebrate his 85th birthday. Former President George W. Bush is willing to do whatever it takes for his brother’s potential presidential campaign — even if that means staying out of the spotlight. In a new interview that aired Sunday on CBS’ “Face the Nation,” Bush said he was “all in” for former Florida Gov. Jeb Bush (R) to continue the family tradition and make a bid for the White House. Various family members, including former President H.W. Bush, have publicly encouraged Jeb Bush to enter the 2016 race and there have been other signs that he’s seriously exploring a run. However, George W. Bush told CBS he’d only give about a 50% chance that his brother ultimately pulls the trigger on a campaign. Bush also responded to his mother, former First Lady Barbara Bush, declaring that there have been “enough Bushes” in the White House and she didn’t think Jeb Bush would launch a presidential bid.